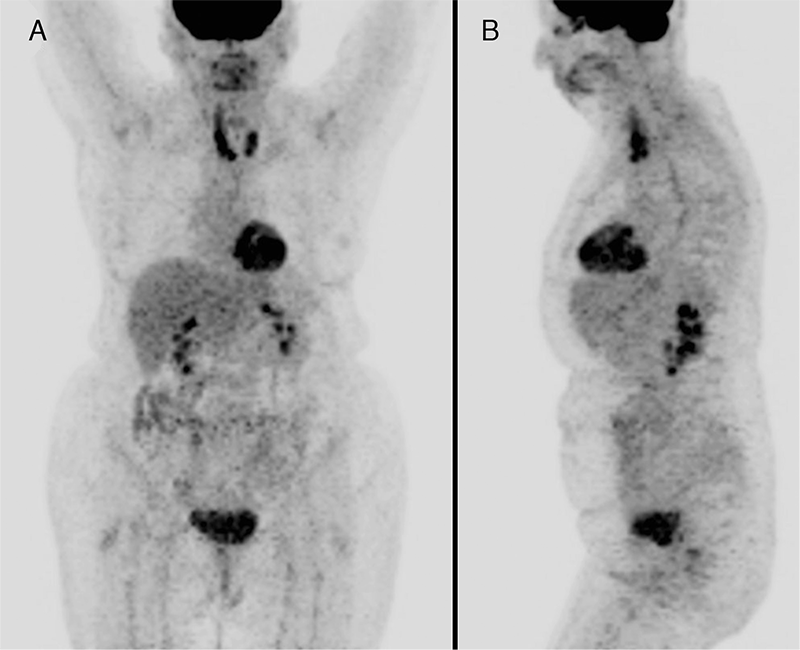 A 67-year-old female patient with no prior history of benign thyroid disease was diagnosed with primary thyroid lymphoma and was staged with 18F-fluoro-2-deoxy-D-glucose (18F-FDG) positron emission tomography/computed tomography (PET/CT). 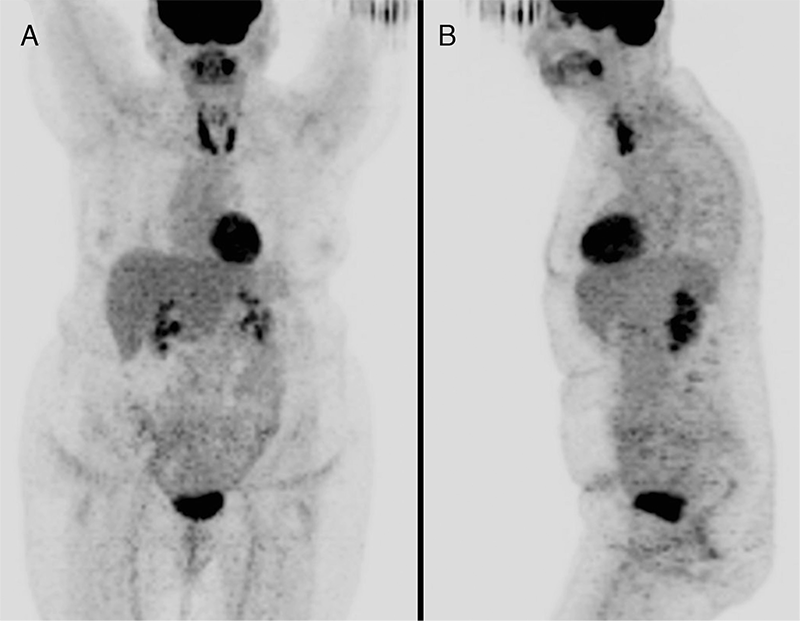 She was treated with chemotherapy and external beam radiation therapy, and a follow-up PET/CT showed significant reduction in the size of the thyroid lymphoma with persistent intense 18F-FDG uptake, which was interpreted as partial response to therapy. However, two subsequent PET/CT studies showed no change in the persistent intense 18F-FDG uptake in the thyroid and a biopsy confirmed the presence of thyroiditis with no evidence of residual lymphoma. Follow-up PET/CTs performed over the subsequent three years showed stable intensely 18F-FDG avid thyroiditis with no evidence of lymphoma recurrence. We present the imaging characteristics of a long term radiation treatment induced thyroiditis mimicking 18F-FDG avid residual disease on PET/CT. Informed Consent: All subjects in the study gave written informed consent or the institutional review board waived the need to obtain informed consent. Surgical and Medical Practices: W.M., A.C., S.P., Concept: W.M., Design: W.M., Data Collection or Processing: W.M., A.C., S.P., Analysis or Interpretation: W.M., A.C., S.P., Literature Search: W.M., A.C., S.P., Writing: W.M. 1. Mack LA, Pasieka JL. An evidence-based approach to the treatment of thyroid lymphoma. World J Surg 2007;31:978-986. 2. Graff-Baker A, Roman SA, Thomas DC, Udelsman R, Sosa JA. Prognosis of primary thyroid lymphoma: demographic, clinical and pathologic predictors of survival in 1408 cases. Surgery 2009;146:1105-1115. 3. Graff-Baker A, Sosa JA, Roman SA. Primary thyroid lymphoma: a review of recent developments in diagnosis and histology-driven treatment. Curr Opin Oncol 2010;22:17-22. 4. Onal C, Li YX, Miller RC, Poortmans P, Constantinou N, Weber DC, Atasoy BM, Igdem S, Ozsahin M, Ozyar E. Treatment results and prognostic factors in primary thyroid lymphoma patients: a rare cancer network study. Ann Oncol 2011;22:156-164. 5. Lin EC. 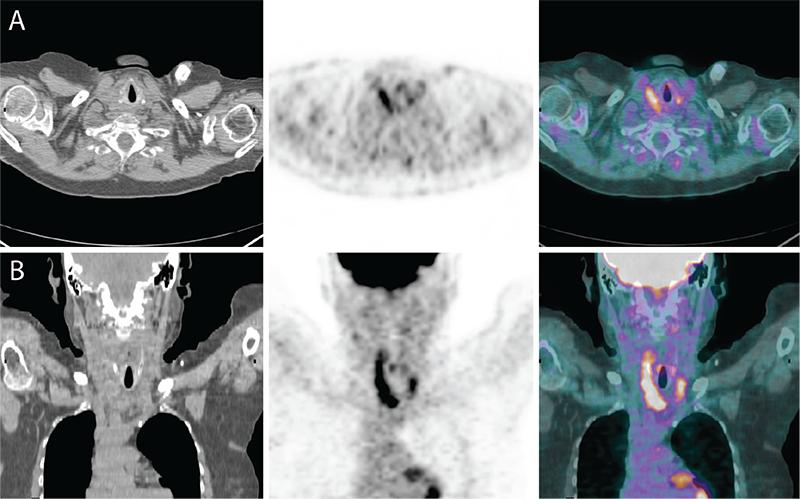 FDG PET/CT for assessing therapy response in primary thyroid lymphoma. Clin Nucl Med 2007;32:152-153. 6. 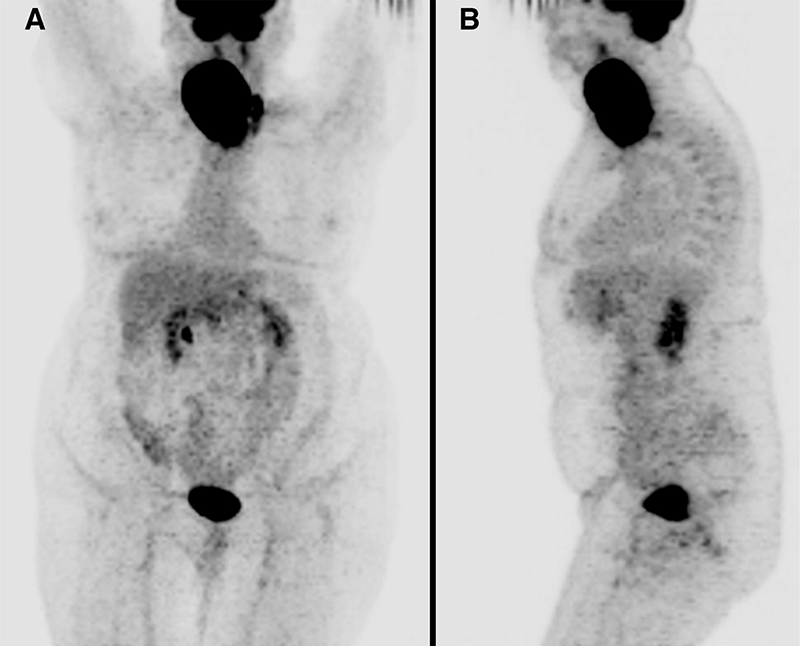 Basu S, Li G, Bural G, Alavi A. Fluorodeoxyglucose positron emission tomography (FDG-PET) and PET/Computed tomography imaging characteristics of thyroid lymphoma and their potential clinical utility. Acta Radiol 2009;50:201-204. 7. Nakada K, Kamijo K, Fujimoto N, Sakuma I, Sakurai M. Is FDG PET valuable in monitoring early therapy response in primary thyroid lymphoma? J Nucl Med 2010;51:1611. 8. Kurata S, Ishibashi M, Hiromatsu Y, Kaida H, Miyake I, Uchida M, Hayabuchi N. Diffuse and diffuse-plus-focal uptake in the thyroid gland identified by using FDG-PET: prevalence of thyroid cancer and Hashimoto’s thyroiditis. Ann Nucl Med 2007;21:325-330. 9. Hunt JL. Radiation induced thyroid diseases. Pathology Case Reviews 2009;14:224-230. 10. Kubota R, Yamada S, Kubota K, Ishiwata K, Tamahashi N, Ido T. Intratumoral distribution of fluorine-18-fluorodeoxyglucose in vivo: high accumulation in macrophages and granulation tissues studied by microautoradiography. J Nucl Med 1992;33:1972-1980. 11. Yao M, Smith R, Graham MM, Hoffman HT, Tan H, Funk GF, Graham SM, Chang K, Dornfeld KJ, Menda Y, Buatti JM. The role of FDG PET in management of neck metastasis from head-and-neck cancer after definitive radiation treatment. Int J Rad Onc 2005;63:991-999. 12. 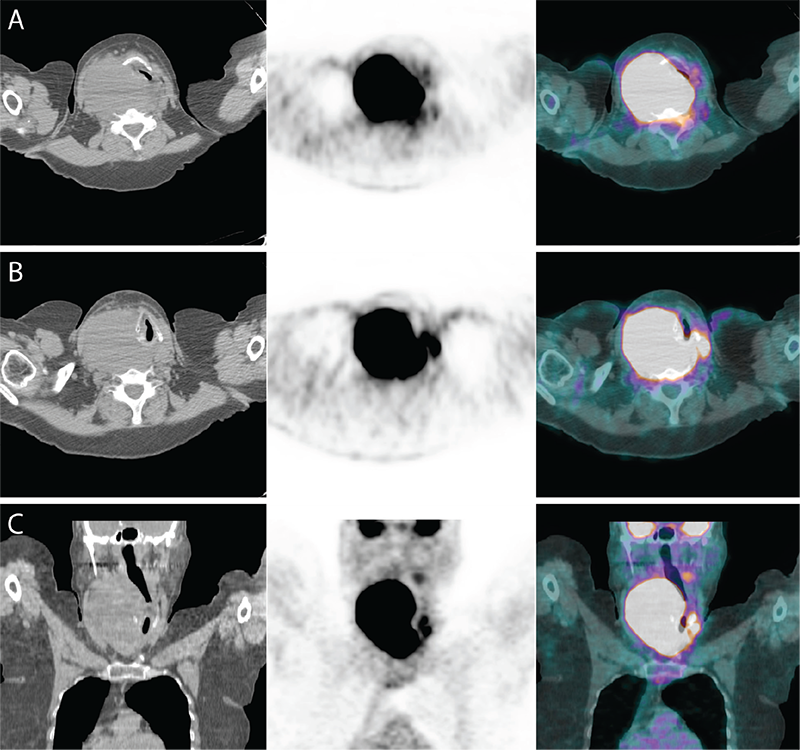 Andrade RS, Heron DE, Degirmenci B, Filho PA, Branstetter BF, Seethala RR, Ferris RL, Avril N. Posttreatment assessment of response using FDG-PET/CT for patients treated with definitive radiation therapy for head and neck cancers. Int J Rad Onc 2006;65:1315-1322.